I had some time today and did work on Army Ops even if it wasn't planned to this month. I was able to add a "simple" but powerfull and flexible Class Selection. At the current time classes serve only the purpose to have different weapons and player models and no ther mechanics. Even if one class is called Medic, there is currently no Medic System implemented (but will come). Everything is very early work in progress and nothing of the classes is final. It's just a early test filled with placeholder content. I want to bring back the medic system like in AA 2 with the class and loadout system of Proving Grounds. I'm getting rid of the Squads as they didn't make a big difference in gameplay and choose the more flexible version of Proving Grounds. Why? Because it's more flexible and allows to setup different gamemodes a lot easier. I used this weekend to add basic lean functionality as well as recoil and reload system. Everything is very basic and especialy recoil is just set with some placeholder variables but it's working fine and is well playable online. This is also very early on and far away from finished but we come closer to a real playable version. KEAPs 133 are you in the possision to make respawn on 2.5 and 2.8.5 P.v.P and Bots maps to puth on and out in game!! Can you please explain a bit more what you mean? I just wanted to say thanks for investing your time and energy into bringing this game back to life. I look forward to it. Sorry for the late rely quite some busy days currently. There are currently no such plans for the next time. Once the core gamemode is done I'm able to extend on that and do something like this. But as I said I need to finish the core gamemode which takes a lot of time. 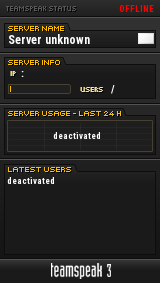 Dedicated server is up an running! This moment marks a very important point in Army Ops development. For the first time a dedicated server is up and running. This is a major step toward the first test session. Serveradmins did I miss something very important? we want to sponsor your project. Round timing? Unless you want it to be specific and map-related, but that's gonna prevent people from using maps for tournaments and such (where there's typically a shorter round, say between 2 and 3 minutes). Yes you are right. I'm currently not sure how I will do this. My plan is to make one giant modular gamemode and allow server admins with a special tool to create own gamemodes by just creating a text file. So everyone could create its own tournament mode with new rools/gameplay. In detail what I was thinking about a simple config file to serve as new game mode where the admin only needs to setup variables. If this works it should be possible to set up a gamemode which mixes Objective (like Pipeline) with VIP Gamemode within seconds. And in this same config round time, amount of round, team setups and so on would be located. If my Idea does not work I'll add classic round variables.